Microsoft co-founder Bill Gates has finally joined Twitter.The account is a genuine and verified Twitter account meaning it’s confirmed by Twitter.Despite being so late to the Bill Gates has become an overnight Twitter sensation(2+ Lakh Followers ). This is the amazing power of Social Media and you will see how Bill Gates can use Twitter as a very effective marketing and publicity tool. “Hello World.” Hard at work on my foundation letter – publishing on 1/25″. 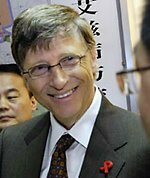 Bill is following some 40 other tweeters, including Barack Obama, Hollywood’s hot actress Ashley Tisdale, the Whitehouse, as well as Microsoft and the Gates Foundation.And one more thing that Tuesday 19th, he was back on Facebook with a new page.And on Facebook, Gates has posted pictures of his trips to Africa and India.